Moulded in Polypropylene, these two piece funnels are light weight, easy to clean and autoclavable. The top portion can be snap fitted with the lowe one forming a vaccum seal which does not require greasing. The base of the top portion has a perforatedfilter plate. WE are suppliers of Porcelain Lab wares, Buchner funnels with different dimensions like :35mm, 50mm, 75mm, 100mm, 125mm, 150mm, 200mm, 250mm& 300mm. 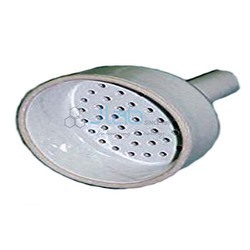 We offer our clients with an impeccable range of Buchner Funnels with Cone Stem. Our range comprises Sintered Disc with the porosity G-0 to G-4 and is in compliance with the required international quality standards. These are manufactured using quality raw materials and advanced production methods. Moulded in Polypropylene, these two piece funnels are light weight, easy to clean & autoclavable. The top portion can be snap fitted with the lower one forming a vaccum seal which does not require greasing. The base of the top portion has a perforated filter plate. 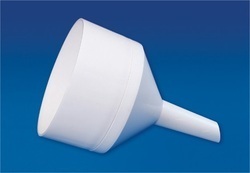 Molded in Polypropylene, these two piece funnels are light weight, easy to clean & autoclavable. The top portion can be snap fitted with the lower one forming a vacuum seal which does not require greasing. The base of the top portion has a perforated filter plate. Moulded in poly propylene. These two piece funnels are light weight easy to clean & auto clavable.